I have been attending herbal classes. While I know some of the benefits of the nutritional properities of some herbs, I always enjoy learning more. 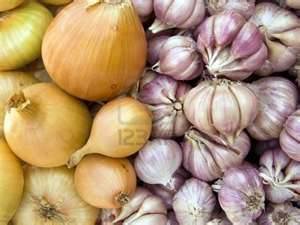 So I thought I would share the benefits of onions & garlic. The distinctive odor that garlic produces doesn’t occur until it is crushed. This is the plant’s defense mechanism against insect predators. Garlic cloves contain an odorless , sulfur-containing phytochemical called “alliin.” When the clove is disrupted, alliin is released and reacts with an enzyme in the neighboring cells that converts it to the odoriferous “allicin.” Allicin is the garlic’s bug repellant – and a “people” repellant which is why many folks are shy about eating it. If that’s the case, roast or cook whole to avoid the smell. Are your mealtimes with your child pleasant?